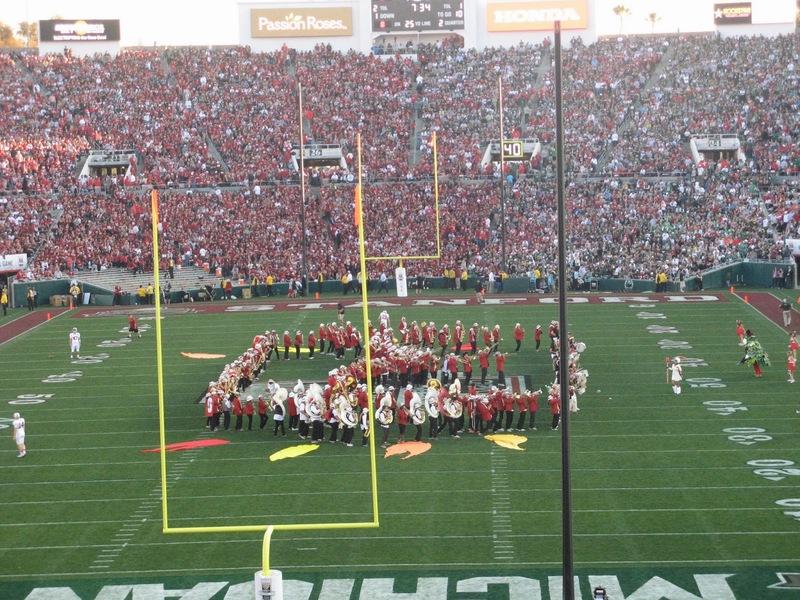 I attended the Rose Bowl this year for the first time in my life. Growing up in the state of Michigan, I remember watching the televised Rose Parades every year and the annual football game. It seemed at the time that the only schools from the Big Ten conference that played in that game were the University of Michigan and Ohio State University. My mother was a graduate of Michigan State University (MSU), as well as many of my aunts, uncles and cousins. I grew up being surrounded by MSU partisans and later, that is where I went to college. Back in the 1970s and 1980s, MSU's football program wasn't the greatest. I attended the games while in school, but we lost more than we won. 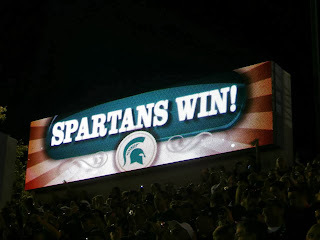 This changed after I graduated when they hired a new coach and in 1988, MSU went to the Rose Bowl and beat the University of Southern California. I couldn't attend that game due to timing and finances, but I did cheer on my team as I watched the televised broadcast. The last few years have been nail biters as to determining if MSU was going to go to the Rose Bowl. About three years ago when I thought there was a good chance MSU was going to go, I started investigating how we would actually get tickets. I called a friend who went to the game back in 1988. Josh had a friend who was a season ticket holder and who allowed him to purchase the Rose Bowl tickets reserved for him. I didn't think that it was likely I could score tickets that way, so I went online and discovered the Team Tix option. Team Tix is a money making scheme, similar to buying stock options. You don't actually purchase the tickets, but reserve the opportunity to buy tickets at face value should your team attend the Rose Bowl. In September, you go to the Tournament of Roses website and follow links to the Team Tix site. The earlier you start the process, the cheaper it is and the greater number of tickets available together. These are non-refundable reservations and you are obligated to buy the tickets if your team wins, and please note that the fee paid to reserve tickets does not apply to the cost of the tickets themselves. The longer in the season you wait, the higher the price per reservation and the fewer reservations are left. Once all the reservations for a specific team are sold, then there is the ability to trade them on an online market where people will place bids for these reservations and the current holders will determine which bids they want to accept. So we paid money for reservations in 2011 and 2012, but didn't get any tickets from the process. We just gave money to an agency for the right to dream that our team would go to the Rose Bowl. For them, it is like printing money. They get money from alumni from dozens of schools who get nothing for their reservations. It is kind of like playing the lottery where you know going in that you might not win and you won't get your money back if you lose. This year, it worked for us. We reserved four tickets at $25 a reservation and when Michigan State won the Big Ten Championship playoff game against Ohio State University, we received an email the next day telling us how to obtain our tickets at the face value of $150 each. That experience was a lot better than a friend of mine who decided two weeks before the Big Ten Championship game to try and get tickets for the Rose Bowl. The Team Tix at that point was red-hot for MSU fans and her online bid didn't get accepted, like she thought it did. Instead, she had to wait until the tickets went on sale to the general public on a Tuesday morning. Ticketmaster was sold out of their allotment in minutes. My friend Sue wound up paying a different website $520 per ticket for two seats near the Stanford end zone. It was crazy, but at least she bought tickets at that point in time. Later, the secondary market had tickets over a thousand dollars each. That's what happens when it is twenty-six years between Rose Bowl appearances, you get a lot of pent up desire by alumni to attend. MSU did have a certain number of tickets reserved for their alumni, but 24,000 was not close to meeting the demand. 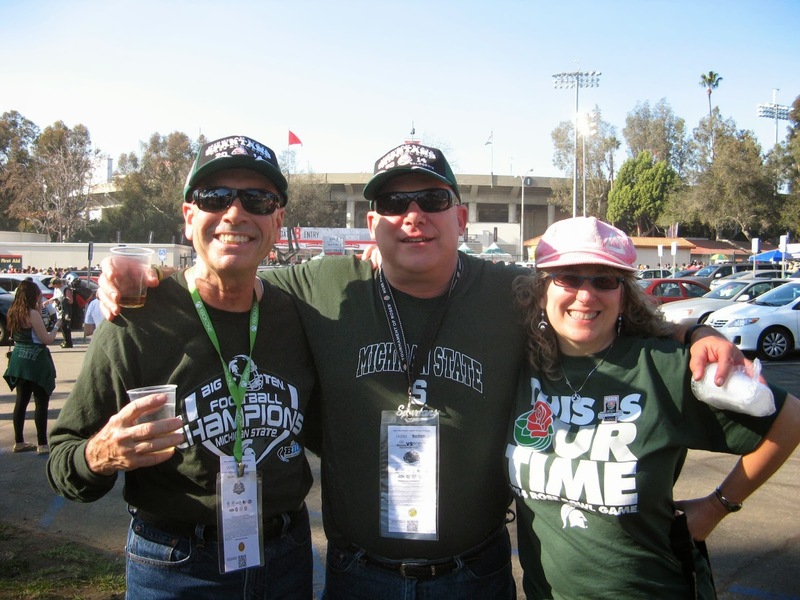 The alumni tour packages sold out instantly and some creative Spartan fans looked to the Stanford allotment of tickets and found a loophole. Since Stanford had gone the previous year and won at the Rose Bowl, there was not the same level of hunger by their alumni to attend the Rose Bowl. Stanford offered the ability to purchase four Rose Bowl tickets at face value to those who put a $100 deposit down on 2014 season tickets. It was discovered that MSU fans were swallowing up these tickets with no intention of purchasing season tickets at Stanford. Once it was discovered, this opportunity was taken down off the Stanford website. That is why there were many Spartan fans in the Stanford sections. Since we live in California, we didn't have the travel headaches that Michiganders did. We simply chose which day we wanted to start driving down and arrange for hotel accommodations. We ran into a few Spartan fans who said they were unable to get a flight into LA, and instead flew into Las Vegas and got a rental car to make it the rest of the way. That's just crazy, but it does show the determination of Spartan fans to be where they needed to be to cheer on their team. Getting hotel rooms in the area was a difficult and expensive task. We decided to avoid the Pasadena area entirely and instead looked to Anaheim the home of Disneyland. 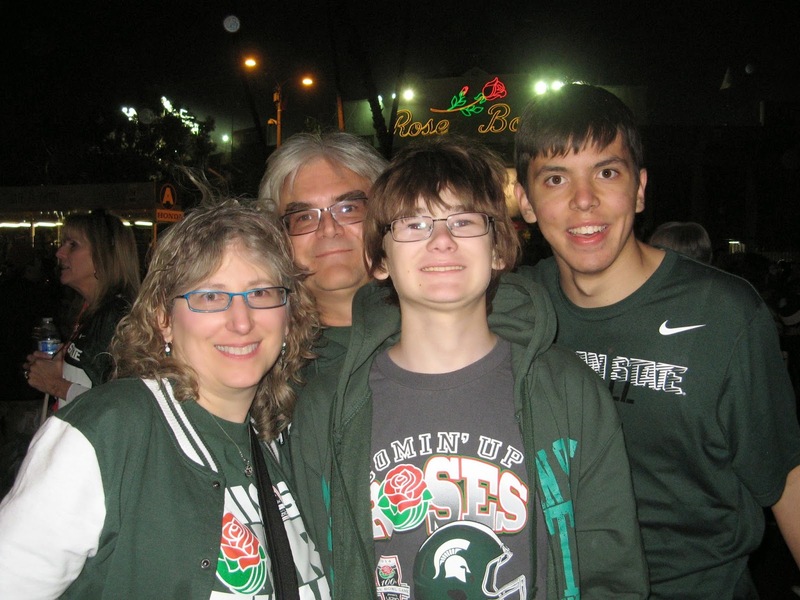 We went to the theme parks on December 31st and January 2nd and saw many MSU fans wearing Spartan green. After making the decision to watch fireworks on New Year's Eve at midnight meant that getting to Pasadena early in the morning to be at the parade would be pushing our luck and energy. If we tried doing everything, we would be exhausted by the time the game started and *the game* is the reason we were down there in the first place. So we decided against going to the parade and instead just programmed it to be recorded on our DVR before we left home. There is limited parking at the Rose Bowl Stadium. It is first come, first served with the lots open at Oh Dark Thirty in the morning. I am not joking, the parking lot opens at 4 am. Imagine celebrating New Year's Eve at midnight and then getting ready to wait in line for a parking lot to open four hours later. YIKES. 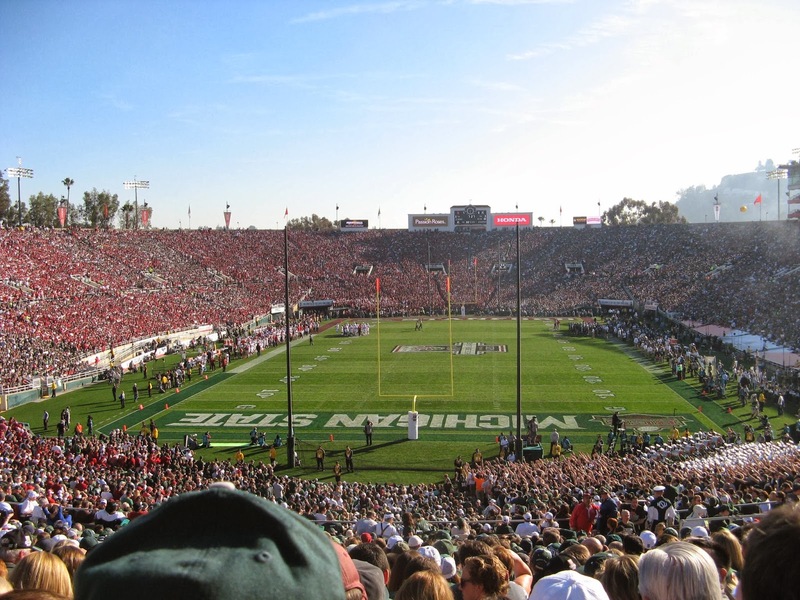 The Rose Bowl Stadium does allow for tailgating before games, but there are specific rules about that and a long list of prohibited items. There is also another parking lot that is about a half an hour's walk away - the Parson's Lot. 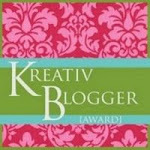 They have passes you can purchase in advance and that is the option my husband chose. However, we did not get the pass in the mail when it was promised. By the time we realized it hadn't come, and we had the postal Christmas holiday to contend with, it was very late in the calendar year. My husband sent an email and had to wait for a few business days for a reply. Thankfully there was enough time for the company to reply and have passes waiting for us at "will call" at a certain entrance. We would have been better off using a paper map. Instead we trusted modern technology and GPS. BIG MISTAKE. The GPS recognized that there were barricaded streets due to the parade route, but it still tried to direct us through streets we could not traverse. We were coming from Anaheim and made really good time on the LA freeways because it was a holiday and there was no traffic to speak of, but we should have thought long and hard about the parade route and tried to go west and north of the parking lot and then get closer. Instead we followed the GPS and approached it from the south and east. Once we actually got around the parade route and were on the street we needed to be, the traffic was at a snail's pace. We would watch the traffic lights go through two or three cycles where we would advance maybe a single car's length. There is no tailgating allowed at this parking lot, so we had to try and meet up with our friends at the stadium. 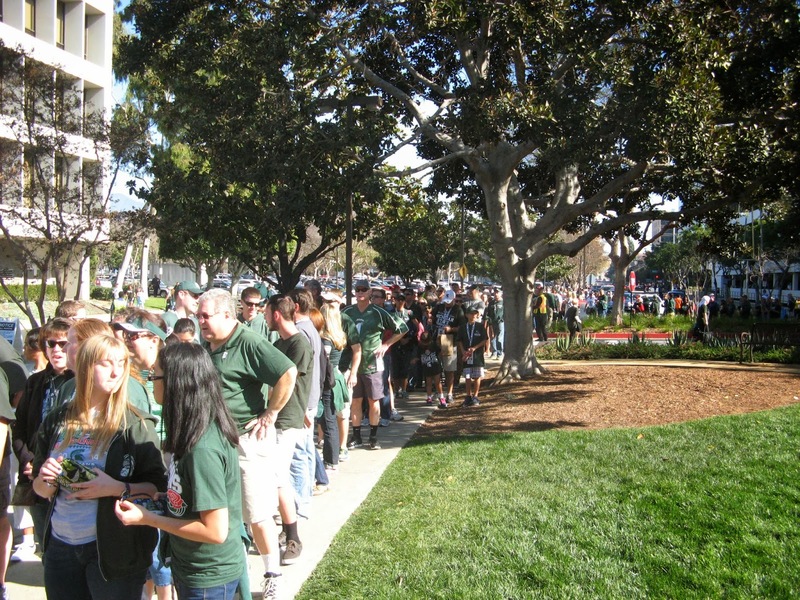 It was a sea of green and white that stretched out into a really long line waiting to board the shuttle buses. There were some Stanford fans wearing red, but they seemed outnumbered by the green wearing Spartans. In retrospect, it would have been faster for us to walk to the stadium. Instead, we waited patiently in line. I had made grand plans to meet up with friends and family before the game. I had read and re-read the guidelines for what was allowed for tailgating. Except, I didn't quite understand some of the finer details so my grand plans didn't work out too well. I did meet up with my Uncle Jim, but that was after several cell phone calls and text messages trying to explain exactly where I was standing using land marks. It wasn't easy, but here we are mugging for the camera. Lessons learned from my attempt at tail gating fiasco: unless I am willing to brave the morning rush of cars at 4 am to get a prime parking spot at the Rose Bowl Stadium's parking lot, forget about trying to bring food or drink to tail gate. They have food and drink for sale in a specified area and will not allow you to bring in anything from the outside. Plus, I should have kept my cell phone in my pocket on vibrate. I certainly could not hear it ring reliably in my purse with the ambient noise of thousands of excited football fans. My husband had brought his nice camera with him. Too bad we didn't notice a mention in the fine print of a prohibition for telephoto lenses. He had to surrender his camera during the game and had only a specified short period of time to pick it up after the game concluded. To make sure he didn't lose out on getting his camera back, he left the game with about three minutes left. So he missed the greatest play of the game which guaranteed Michigan State's victory. 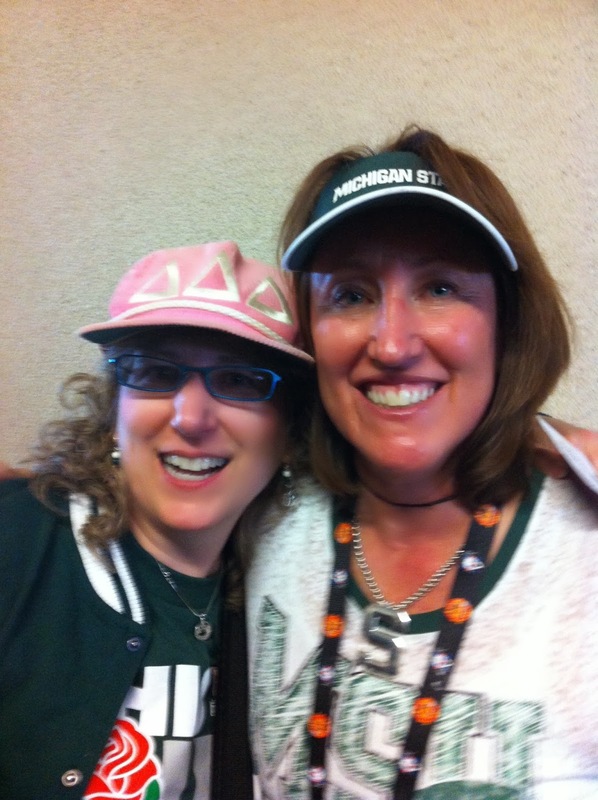 I also ran into my cousin Joann in a tunnel before the game started and had a chance for a quick hug and picture. It was a close, hard fought game. I wasn't too worried when Stanford at the beginning. I knew there was a lot of time left in the game and we would get our chance. The way the fans in the stands near us were singing was a little more "in your face" style. "See their team is WEEEEEAK"
It is fun to sing, but kinda mean. I enjoyed watching the Spartan Marching Band as always. They are a great tradition and I am proud to have them represent my school. I thought the Stanford Band was weird. Their dress is not uniform, their instruments are not always real instruments, (one woman was using a STOP sign as a percussion instrument), they don't really march in formation or make good formations one can understand, their sound is passable but not great. Maybe if it was my school I would learn to love it and feel their irreverent ways were really cool. Being from a different background and competing school, I was taken aback by my surprise in their attire and casual approach to music. I also think the Stanford mascot is weird. They have a dancing tree that looks like it is covered in carpet remnants. Strange. One more thing that I find uncomfortable about Stanford is referring to the team as "the Cardinal." Singular. It is not a title of a religious leader nor of a bird, but instead it is a color. I heard sentences that had strange syntax in them using the singular "cardinal" in a manner meant for plural usage. It was awkward and as someone obsessed with language, it bugs me. A tree as the mascot, but the team is referred to by a singular color. Eh? 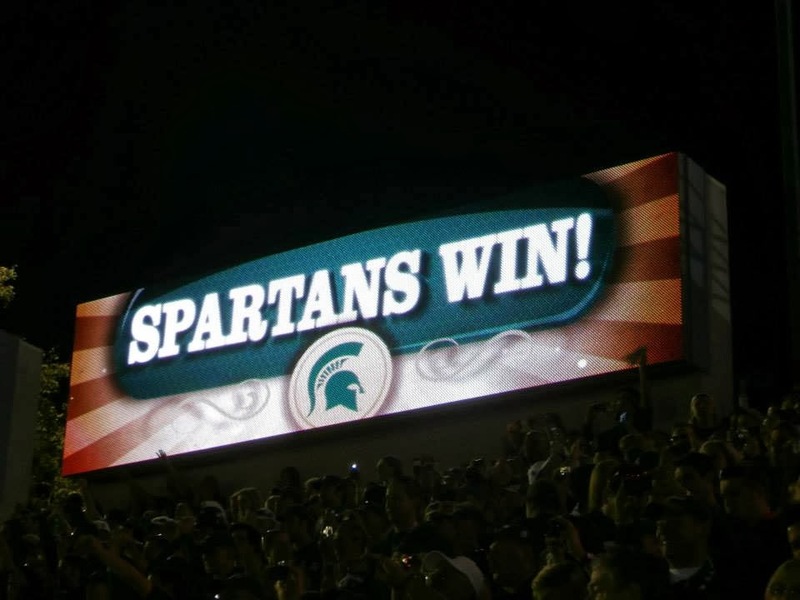 Michigan State University's mascot is Sparty, but the school and the fans are referred to as Spartans, and our colors are green and white. It doesn't seem difficult to understand or say in the singular or plural usage. My group of happy Spartan fans found each other after the game was over in the parking lot. We decided to follow the large crowd walking back to the parking lot rather than wait for the incredibly long queue to take shuttle buses back. That was one of our best decisions of the day. All in all, it was a great time and one that I am glad we did. 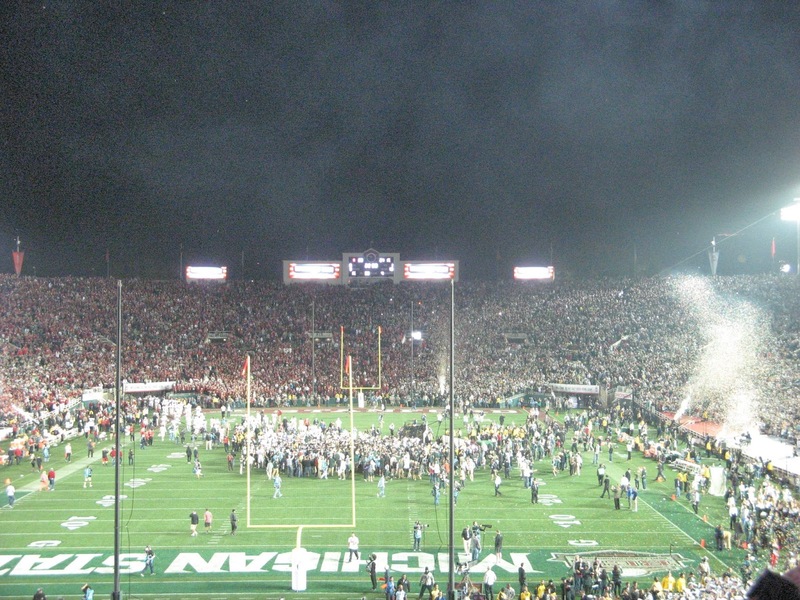 I will always have the memories of being at the 100th Rose Bowl and cheering on my alma mater to victory.